For those of you from the cassette tape days, you might find this Valentine's Day card from Exopolis a little bit of fun. Back in the day, kids placed their cassette tape recorders next to their clock radios to record their favorite songs while playing DJ making cheesy mix tapes for their friends. Exopolis has taken that practice digital providing a cassette tape juke box of sorts with classics like Hall & Oates' Kiss on my List and our fave, The Divynls' I Touch Myself. Here's an ad that gets right to the point. 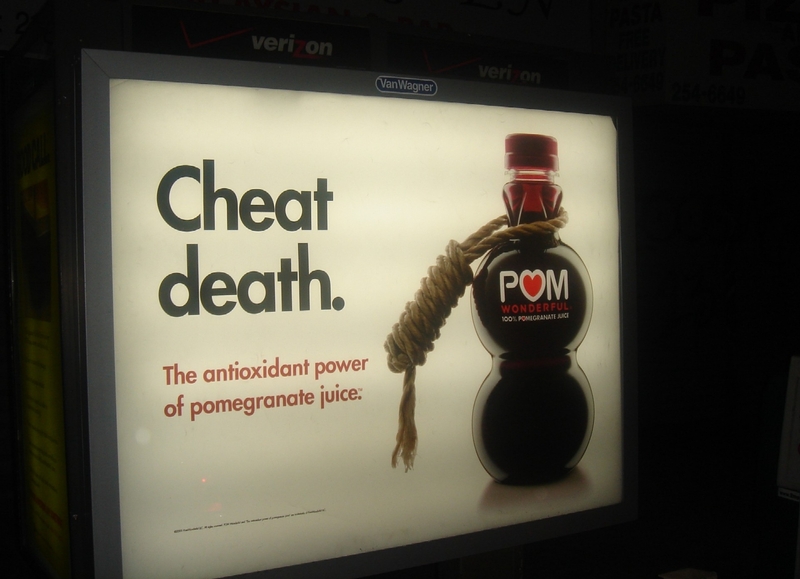 Our man with an eye for the cool, Bucky Turco snapped this shot of of a poster in New York for POM pomegranate juice which, apparently due to its plethora of antioxidants, helps one "Cheat Death" as the headline and visual so succinctly says.